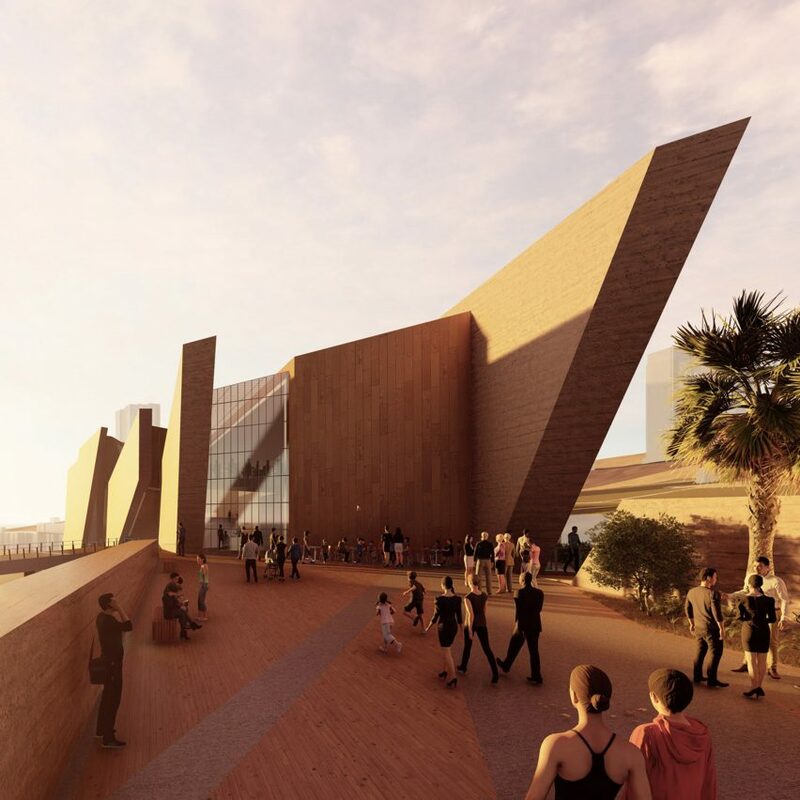 Daniel Libeskind’s architecture firm has revealed plans for a museum in Iquique, Chile, featuring jagged, earthy concrete walls that are intended to evoke “the stark landscape of the Atacama Desert”. 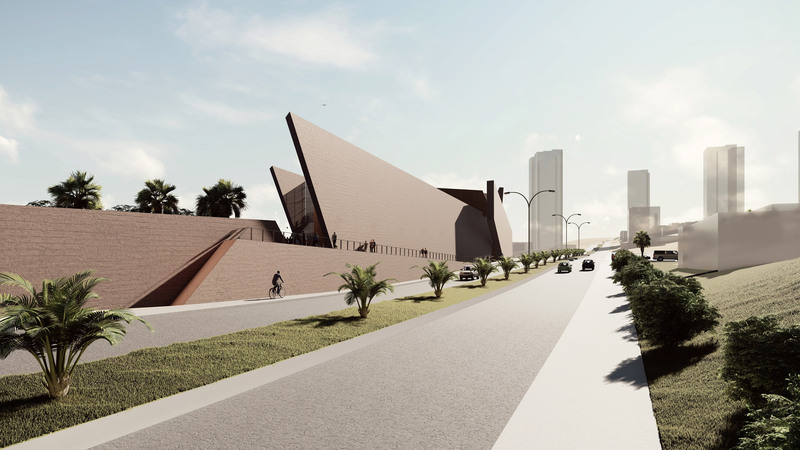 Studio Libeskind has designed the structure to replace the Museo Regional de Tarapacá (MAR) – which translates as Regional Museum of Iquique – in the northern Chilean port city of Iquique. “The inspiration for the design entitled ‘El Dragon de Tarapacá’ came from the stark landscape of the Atacama Desert, the giant cliffs and the urban dune of Iquique, the ‘Cerro Dragon’,” said Studio Libeskind in a project statement. Renderings of the structure show it comprises huge slanted walls that enclose a glazed volume. “It consists of three pairs of parallel vertical walls shaping the major spaces of the museum,” said the studio. Locally sourced materials, such as earth-coloured concrete and hardwood timber flooring, are to be used in the construction of the museum to “reference the palette and textures of the surrounding natural landscape”. Set to be built along the city’s main boulevard, Avenida La Tirana, the 3,760-square-metre building will allow for a larger showcase of the existing Museo Regional de Tarapacá, which was completed in 1892 and is too small for the museum’s vast collection. Works on show will cover more than 6,000 years of history of northern Chile – including pre-Hispanic history of the Atacama Desert, the colonial history of Chile, its mining years and the present day. Displayed in the museum are notable archaeological remains discovered in Iquique’s Cerro Esmeralda (Emerald Hill), a coastal mountain range of the Andes. Many artefacts are also from the Chinchorro, Pica, Tarapacá and Inca cultures. Currently, the existing museum can only display approximately 20 per cent of the collection. In Libeskind’s scheme, these artefacts will be shown in exhibition spaces that span two levels and run along the length of the building. At one end, an area is proposed to feature a mirror wall to reflect the surrounding cliffs and dunes. Additional areas include a cafe that is set to overlook the coastline to the south, with spaces intended for education and events below. 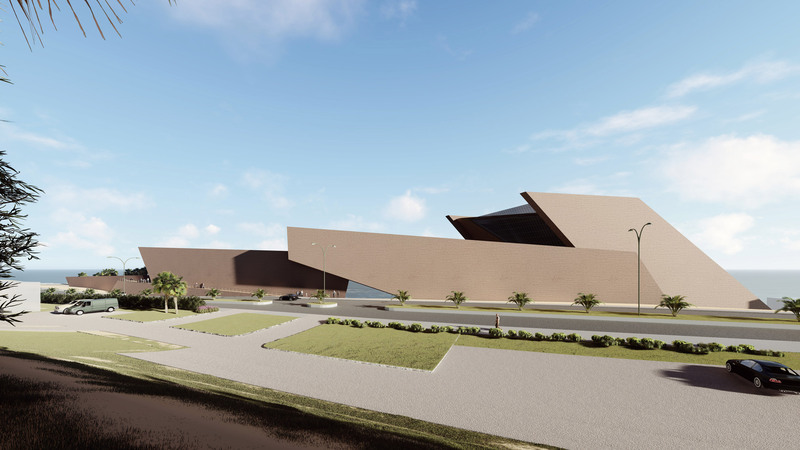 Chile’s new Museo Regional de Tarapacá is slated to break ground in early 2020. Studio Libeskind has designed a similarly slanted cultural building in Canada: the National Holocaust Monument in Ottawa. Meanwhile, in 2001, Libeskind’s preference for leaning walls was presented in his design for the Serpentine Pavilion in London, at the city’s Serpentine Gallery in Hyde Park. Daniel Libeskind is a Jewish Polish-American architect, who founded Studio Daniel Libeskind in 1989 with his wife Nina. The firm, which has offices in New York and Zurich, has completed a handful of other museums, including the Jewish Museum Berlin and accompanying education centre, the MO Museum in Lithuania, and the Museum of Military History in Dresden. In July 2018, Studio Libeskind unveiled a museum in China, which is the firm’s first project in the country. Renderings are by Studio Libeskind. The post Daniel Libeskind designs angular archeology museum for northern Chile appeared first on Dezeen.